Phil led this ride out and I led back. There was an early 9.00 am start at Walbeton Pond for the ride over to Wiggonholt. A good sized group gathered being myself (Edwin) Phil and Mary, Avryll, Ann, Colin and Harvey. Weather was very cold early on near to freezing but rising to 13C later with a lot of sunshine. We took a direct route via Madhurst and then down Houghton Hill. There was a striking view from the top with layers of mist in the Valley. We continued via Amberley to Wiggonholt. We were joined there by Eric, Mike and Jeff. A good number from Arun Adur attended and a few from Horsham. After the AGM we went on to Amberley for lunch where Sam was just leaving. 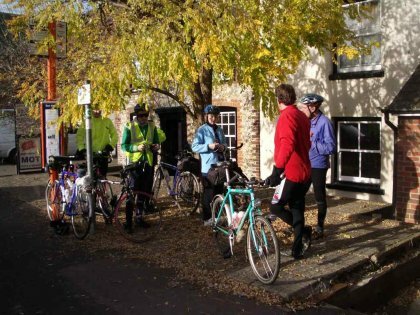 We joined Arun Adur on the way back as far as Houghton where they turned off to do a longer loop round via Sutton and we headed straight back with a diversion via Slindon to stop for tea at Aldingbourne. Phil led this ride out and I led back. 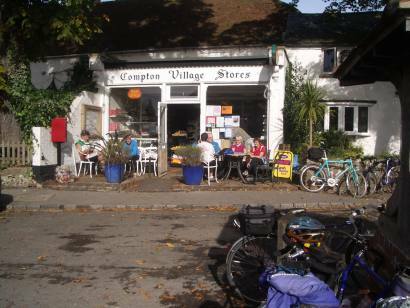 There was an early 9.00 am start at Walberton Pond for the ride over to Wiggonholt. A good sized group gathered being myself (Edwin) Phil and Mary, Avryll, Ann, Colin and Harvey. Weather was very cold early on near to freezing but rising to 13C later with a lot of sunshine. Sunday 22 October. Ride to West Stoke for AGM. Heavy rain was forecast for today but it started dry if threatening. 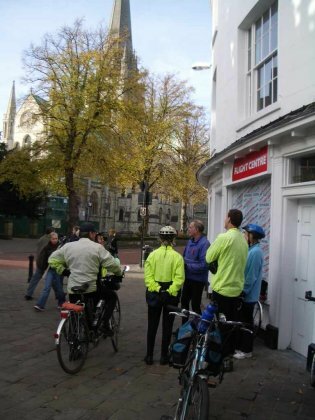 Alan had asked me to lead the ride for him and I went to the Cross but only Phil turned up. 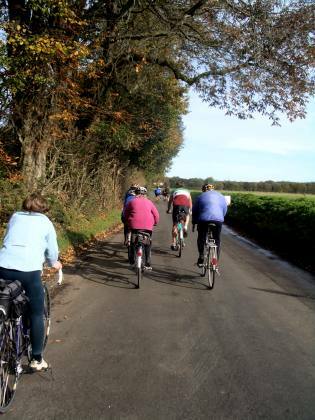 The ride was short heading out on Clay lane and then up a lane to West Stoke Village Hall. Gill, Harvey, Colin and Adrian came by bike direct. Another 13 came to the AGM car assisted so 19 in all attended. We went through the usual business of minutes and Accounts. All of the Officers and Committee were re-elected unopposed. Under any other business we decided to make the day for all Evening Rides Thursdays and had a long discussion on various methods of attracting new members. The rain started soon after we got in the Hall and continued torrential throughout the meeting. After the meeting some of us had sandwiches in the Hall. Nobody was interested in going on to the Pub. It was 1.20 by the time I left the Hall by which time the rain was just starting to ease from torrential to light. Everybody on bikes made their own way back at different times and in different directions. I headed down a lane towards Chichester which was like a river in places. My departure time was well chosen as the rain eased to very light during my ride with the next pulse of torrential rain starting soon after I returned home. Exactly 20 miles for the day and a good workout for the waterproofs. I met up with Steve, Nicola & Ernie at Petworth at 11.00's and Christine Howard & Chris Dart at lunchtime. All rode back to Pulborough and other points south. Cracking weather. Sunny all day and up to 18C. Sunday 8 October. Selborne Ride. 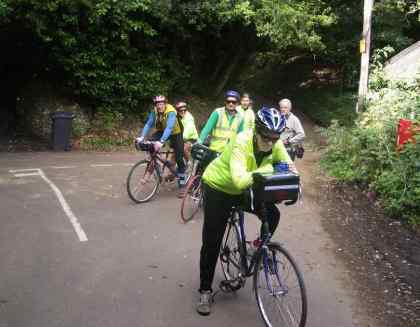 Today there was a choice of a long ride from Chichester to Selborne or a short car/train assisted ride to Selborne from Petersfield. Weather was generally good with long sunny spells and temperatures up to 17C. 4 of us met at the Cross, myself (Edwin) Richard Boulton and Phil and Mary. By coincidence all of us had just returned from Greece. Honed by 2 weeks of Greek hills we made good progress and I had to add on some extra loops on byroads to avoid reaching Petersfield too early. At Petersfield Tesco we met Gill, Adrian, Colin and Christine. We headed out of Petersfield to the North and then a convoluted route on twisting narrow and quiet byroads via Hawkley up to the Queens Head, Selborne for lunch. In the afternoon it was more backroads via Blackmoor and Greatham and then up to Rake to the Garden Centre for tea. Adrian, Gill and Christine headed back via Petersfield while the rest of us headed back to Chichester via Rogate. I added a sting in the tail to the ride with a steep climb up Telegraph Hill to the Downs above Harting and then back via Chilgrove. 60 miles from and back to Chichester, about 25 miles from and back to Petersfield and 71 miles for me from Pagham. Thursday 5 October. Mykonos, boat trip to Delos. Today was our day of Classical Culture with a trip by boat to the nearby small Island of Delos with many ruins from ancient Greek times. Weather was bright blue skies with light winds and temperatures up to 26C. We had an early breakfast and caught the 9.00 am ferry from the Harbour which arrived already laden with American Tourists from a cruise Ship moored nearby. The crossing was 30 minutes. 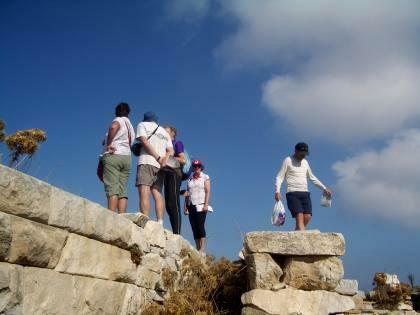 We followed advice from a guide book and took a hilly circuit first which meant of course a climb to the highest point on the Island which few of the tourist attempt to about 300ft up to the ruins of the temple of Zeus. We stopped there for elevenses with great views. Then on to explore more of the ruins with good reconstructions of Temple Columns and a visit to the Museum. We found some shade for a picnic lunch and explored more ruins before catching the last ferry back at 3.00 p.m..
We relaxed with a tea and Ice Cream stop back at the Harbour. Tomorrow we fly Back so a few statistics. 202 miles for the 14 day trip but all very high quality with 17096ft of climbing (over half the height of Everest) I took about 1300 digital photos during the trip. Wednesday 4 October. Ftelias Beach Ride. Today was a nominal rest day or non moving on day. I looked at the map, saw a road up the highest road on the Island and suggested we rode up it followed by a trip to the beach. I was quite surprised that everyone went along with this idea. Weather was again great with clear blue skies all day, light winds and hot with temperatures up to 28C. After some difficulty finding the route out of town we got on to quiet byroads past the Airport with a road running alongside the runway and a jet landing 100 yards away from us. 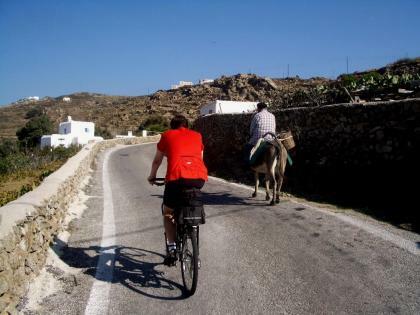 Then on a steep quiet byroad overtaking a local on a Donkey and on to the town of Ano Mera in the centre of the Island for elevenses at a Taverna in the square. Then on to the 1000ft climb up the road to Prof Ilias mountain. We got to halfway up and came to a junction where our route was barred by a sign "Prohibited Area, Military Guard Dogs on Patrol" We turned back some with more reluctance than others. Then a convoluted route on byroads with some steep climbs and then a dramatic descent at 25% gradient to the empty northern beach of Ftelias for a picnic lunch, swimming and sunbathing. We returned to town on the main road with a stop at a pastry shop for tea. 21 miles for the day with 1988ft of climbing. With tomorrow a walking trip on Delos the 7 of us completed 14 days of cycling with nobody getting a puncture.